Blog / Events / Easter in Florence? Here’s what to do! Easter in Florence? Here’s what to do! 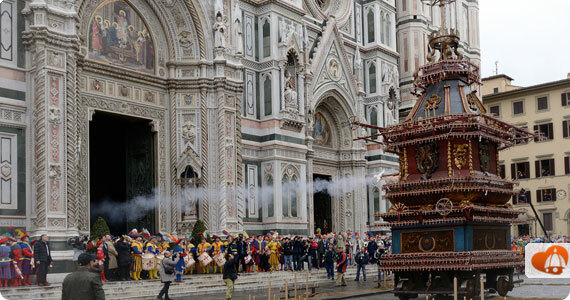 Are you in Florence this Easter weekend? Go see the Scoppio del Carro, of course! If you also want to visit some museums, we have official confirmation (finally!) that the Uffizi and Accademia, among other Florentine museums, will be open this weekend and on Easter Monday! The Uffizi Gallery and Accademia will be open on Monday, day in which they are generally closed. Other museums will either be open on Sunday or Monday (the Medici chapels on Sunday, the Bargello on Monday, for example). For complete details with hours and for online bookings, see this post. If you want a printout to carry around with you, print this. The Galileo Science Museum located right behind the Uffizi will also be open on Monday and will offer free guided visits (for those that visit the museum, of course) focused around the instruments of time through the centuries at: 10.30am, 3pm and 4.30pm. If you’re planning on including this in your day, we recommend you book by calling 055.265.311 or send an email to info@museogalileo.it by this Saturday. If we learn of other museums open this weekend, we’ll update this post!